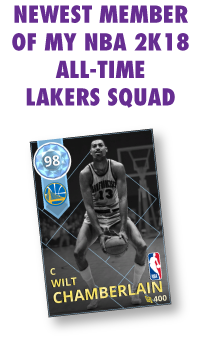 I've updated my all-time Lakers squad with Amethyst coach Steve Kerr, Rim Rocker Michael Cooper, Court Vision Nick Van Exel, and Lakers Historic Karl Malone. In this video I debut Malone but honestly Brook Lopez steals the show. I hope you enjoy the video! NBA 2k18 is surely on of the best of its series. That is a really strong squad you've got there. Going to follow the same lineup for myself.